some may have seen unofficial service. The lpdr Vickers Mk III automatic belt-fed gun was first accepted into service in 1915 but did not see action until the spring of 1917, fitted in small numbers to some FE2b (and possibly other) RAF aeroplanes for both home defence against Zeppelins and ground attack on the Western Front. Contrary to most accounts this was not the same gun as the lpdr Pom-pom used by the other services; at 62 kg (127 kg including cone mounting and ammunition) it was much lighter and fired less powerful ammunition, using a shortened (37 X 69R) cartridge case. There were various projectile types, including a high-explosive shell fitted with the No. 131 fuze. The Vickers was flexibly mounted and fired by a gunner, which meant that its light weight was largely negated by the weight and space required for the gunner and mounting. A few examples of a revised version, the Mk V, were built in 1917 and tested post-war on the R31 airship. In 1915 work on the more powerful 1'/:pdr began, still in 37mm calibre but with a larger cartridge case (37 X 190), and this was the basis for future development. The gun was relatively light for a fully automatic cannon at 64kg (91kg including mounting). 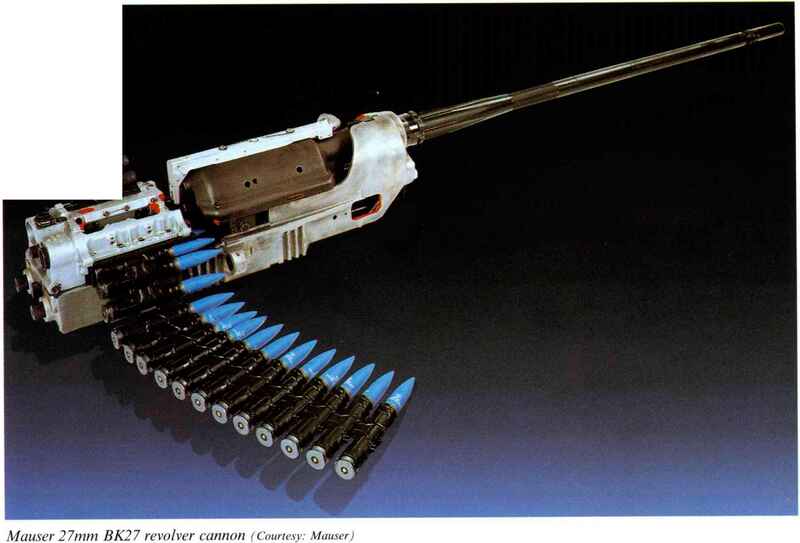 The mechanism used a long-recoil system which limited the rate of fire, reportedly to between 60 and 100 rpm, and the use of five-round clips which had to be replaced by hand reduced the effective rate of fire even further. 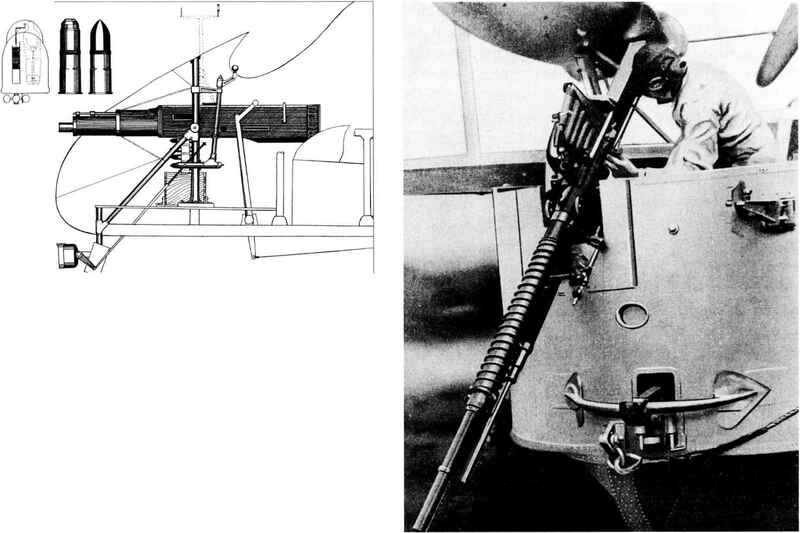 Progress was slow, and although the FE4 of 1916 was designed to use two COW guns, it was not until 1918 that two DH4s were accepted for anti-Zeppelin service, with a single COW gun mounted in the rear cockpit and firing upwards at a steep angle. These aircraft (or possibly two others) were sent to France as bomber destroyers, but there are no reports of any combat use. The most promising British large-calibre weapon by the end of the First World War was the Coventry Ordnance Works 37mm 1 '/2pdr. The Coventry Ordnance Works actually started to develop their automatic cannon before the First World War. It was initially tested (but not down) in one-pounder form in an FE3 in the summer of 1913. A version of the FE6 was also fitted for this gun. The cartridge case was a unique rimless type measuring 37 X 93mm. latter saw service. The FIAT (Fabbrica Italiana di Automobili Torino) modello 1917 gun, generally called the Revelli after its designer, used an eight-round magazine which was a major limitation on the practical rate of fire. The gun was light but not popular, partly because of the low muzzle velocity but mainly because of the very sensitive fuze which was inclined to explode prematurely. Despite this, it did see service, mounted on the Caproni Ca 5. FIAT stopped production after about 200 had been made, mainly because Vickers claimed that it infringed their patents. The Vickers gun actually preceded the FIAT. It used a 25 X 87R cartridge and a twenty-five-round belt feed. It seems that Revelli modified the cartridge case to a rimless 25 X 87 with a sharper shoulder and used the Vickers gun as a starting point for his design. The Vickers was made in Italy as the Vickers-Terni but it appears that the only service use of this gun was, rather curiously, as an AA weapon in some Swedish submarines. By far the most significant of the wartime automatic guns was the first 20mm automatic cannon in the modern sequence of development, the German Becker. Development started even before the war but significant use was not made until 1917, when it was primarily used for the defence of heavy bombers and airships. Its potential as a fighter weapon was never realised as it was, as usual, flexibly mounted and fired by a gunner and its mechanism was unsuitable for synchronisation. It also saw relatively little service before the end of the war, with just 362 examples being discovered postwar by the Allied Aeronautical Control Commission, of which 131 were used in the antiaircraft role. Two other German cannon, the 19mm Szakats and the 20mm Erhardt, were at an advanced stage of development by the end of the war.